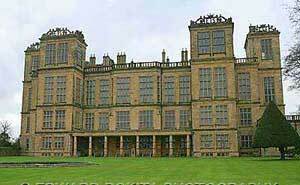 Light and airy because of its many windows, Hardwick Hall was built by Bess of Hardwick in the 16th century. Bess had risen to become Elizabethan England's second most powerful woman through a succession of mostly happy marriages. Hardwick Hall has been a dower house of the Devonshire family until recently and has escaped architectural change, though the National Trust has cleaned up the stonework, and its gleaming towers now look as new as the day they were built. The interiors of Hardwick Hall are amongst the most exciting in England, in particular, the Great Chamber and the Long Gallery. It contains a magnificent collection of tapestry and period needlework. 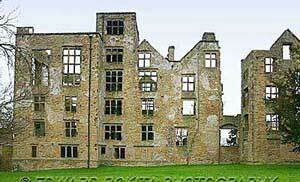 Most of the large Tudor houses had Long Galleries. They were often used to exercise in whenever the weather was too bad to venture outside or onto the roof. They would often be hung with portraits of the Tudor monarchs and with pictures of family members and friends. The Long Gallery at Hardwick was most impressive, with several portraits of Elizabeth hanging on their walls. 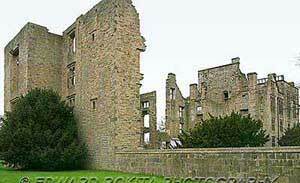 Also, as most Tudor rooms were generally quite gloomy because of the lack of light, the large windows that opened on to the long gallery at Hardwick must bathed the space in sunlight, and made a striking and dazzling impression on visitors. There are gardens and 300 acres of parkland with woods and meadows, which offers great walks, and many attractice views. A circular walk around Miller's Pond offers mobility impaired visitors a good way to enjoy the countryside with improved wheelchair access to the banks of the Great Pond, and a restaurant. The visitor can picnic by the lakes, enjoy lunch in the licensed restaurant, browse in the gift shop, enjoy a free introductory house talk on the Hall's open days, or visit the Old Hall, managed by English Heritage and only a few minutes walk away. 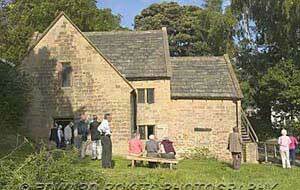 The National Trust holds a variety of events at the hall, throughout the year.